On Sunday, April 7, the Moorestown Jewish Association in partnership with Temple Sinai in Cinnaminson participated in J-Serve, an international day of Jewish youth service. On Sunday, April 7, the Moorestown Jewish Association partnered with Temple Sinai in Cinnaminson for J-Serve, an international day of Jewish Youth Service. From left in the back row are: Caryn Shaw (president of Moorestown Jewish Association), Becky Snyder, Sophia Modena, Robyn Shaw, Danny Gerber and Marla Deibler (VP of Moorestown Jewish Association). In the front row are Maddie Zipin, Abby Zipin. Since 2005, Jewish communities around the world have devoted one day in the spring to the Jewish values of loving kindness and charitable giving. 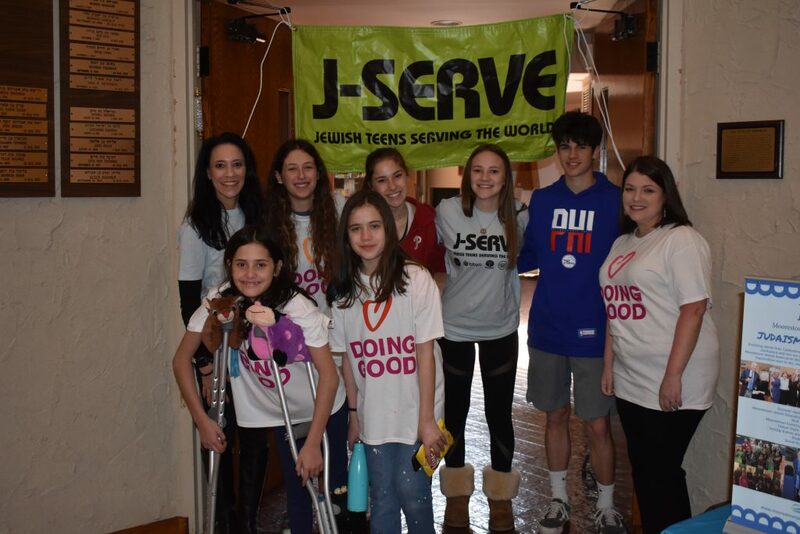 On Sunday, April 7, the Moorestown Jewish Association, in partnership with Temple Sinai in Cinnaminson, participated in J-Serve, an international day of Jewish youth service. Local teenagers tackled a variety of projects intended to benefit local organizations, including filling snack bags for children at Ronald McDonald House in Philadelphia, making American flag pins for local veterans and collecting toys for the Friends of the Burlington County Animal Shelter. Cary Shaw, advisor to the MJA’s teen group, said this is the second year MJA held a J-Serve event. Last year, the Moorestown Community House hosted, but with the space unavailable on Sunday morning, they reached out to Temple Sinai to see if it might want to partner with them. Stacey Blacker, president at Temple Sinai, said their bar and bat mitzvah class students are required to participate in community service, but after the students graduate, there aren’t as many opportunities for students to see one another. She said J-Serve offered a chance for their 16- and 17-year-old members to get together and do some good. Sixteen-year-old Robyn Shaw said in an area like Moorestown where the Jewish population isn’t as prominent, opportunities to get together with her fellow Jewish teenagers are particularly special. “There’s not a lot of Jewish people around here, so it’s kind of nice to once in a while get together and help and benefit other people as one,” Robyn said. Robyn said she and her mother began organizing the event a few months ago. They wanted to target a wide array of organizations, so they thought about the different areas in which they could help. They decided they wanted to help veterans, animals, the sick, the homeless and victims of domestic abuse, so they thought about ways in which they could lend a hand. Shaw said their donations were extremely well-received last year. She said they received thank you notes and overwhelmingly positive feedback after they made their deliveries. J-Serve distributes grants to participating organizations to help subsidize the cost of supplies. Shaw said there’s a fair bit of budgeting and organizing that goes into the weeks leading up to the event to ensure things run smoothly. Shaw said she hopes the takeaway for the teens, who span sixth through 12th grade, is that even the smallest acts of service can have a big impact. She told the teenagers in attendance that one toy could make a shelter dog’s entire day or a senior citizen who may not hear from their family much could feel a personal connection when they receive a handmade bracelet. “I think it’s really important for kids these days to start giving back and understanding that you need to give back,” Shaw said. Becky Synder, 16, said the scale of the day’s event is especially humbling. She said there are hundreds of thousands of Jewish teens all working to make the world better. “I think that’s really meaningful,” Sydner said. For more information on J-Serve, visit jserve.org.